So let’s see what you have been up to this week! Perhaps you have some cleaning and organizing tips to share? I apparently need them ;). And if you missed the features this week, be sure to hop on over to see the AMAZING Fall DIY Decorating Ideas featured. You won’t want to miss them! 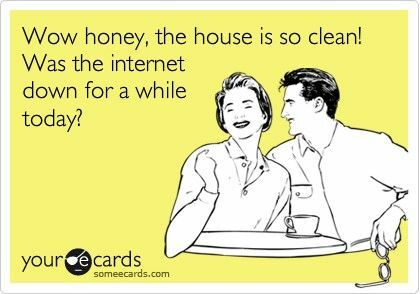 That is so funny about your husband and the cleaner 🙂 I agree, having the house cleaned by someone is the best! I ‘m loving the rag garland and stenciled autumn vase. HaHa, my husband TOTALLY knows when the internets been down! Thanks for another great PAr-Tay! Thanks so much for hosting today Beth! Oh my goodness, i am giddy with tears the few times i’ve had someone clean. sometimes, it all just gets overwhelming…oh yes, i get it! linked up a halloween party! My first ever linking with you… I am still new at it period…lol. I dont think I would torture a friend with my house… I have a 3 year old and a 2 year old…plus I am pregnant… All hope may just be lost. Thanks for the party. Have a great day! Welcome to the party Cas! And yes, it sounds like you have your hands full over there :). I’m having trouble getting into the “Fall Swing of Things.” Possibly because it’s 98 degrees here which makes Pumpkin Spice Lattes just sound……hot. I’m also having trouble getting into the swing of cleaning. But that has nothing to do with the weather. Perhaps your friend is willing to travel? Thanks as always for the party and the great ideas. Thanks for the great party Beth! Hello Beth: Thank you so much for hosting the party. I know what you mean about cleaning and blogging–the blog often tends to come first! Take care, and have a wonderful week! OH my gosh!! I need to hire a friend. My house is a WRECK!!! Ha! Love that. So funny…and unfortunately so true. 😉 thank you for hosting Beth! I believe this is the first time I’ve linked to your party, I might have do so months ago though. Don’t remember. Beth, I bet it feels good to have everything clean though and nothing feels as good as a shower after you have scrubbed all day! My poor micro was so yuck! It’s shiny now… but man, it was bad. LOL! That is so stinkin’ funny!!! Ha … that is too funny! I would love to hire a house cleaner … someday. Thanks for hosting Beth.